Martin Luther King, Jr. was working hard to get people to Washington, DC. But when he told an audience, “We are going to bring the tired, the poor, the huddled masses. We are going to bring those who have known long years of hurt and neglect…. We are coming to ask America to be true to the huge promissory note that it signed years ago,” the year was not 1963, and his issue was not segregation. Instead, it was 1968, five years after his “I Have a Dream” speech, and now the issue was joblessness and economic deprivation. 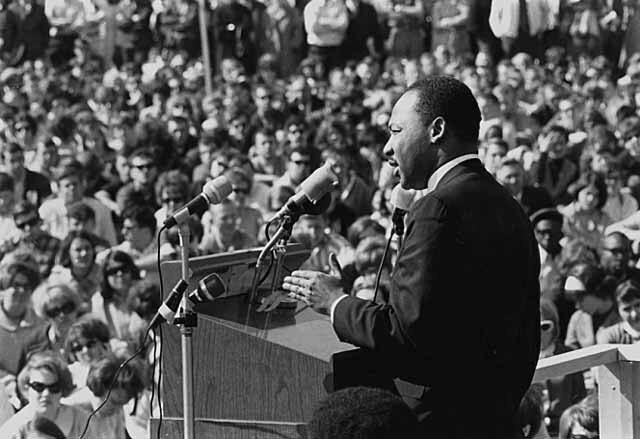 King was publicizing a new mass mobilization led by the Southern Christian Leadership Conference, a drive known as the Poor People’s Campaign. One of King’s most sustained pieces of economic reflection appeared in his 1967 book Where Do We Go From Here? The work provides an important window onto King’s thinking at the end of his life. Precedents for such a proposal could be found in the writings of canonical American thinkers such as Thomas Paine and Henry George. And by the late 1960s, versions of the idea were being offered by prominent economists including James Tobin, Paul Samuelson, and John Kenneth Galbraith. The A. Philip Randolph Institute’s “Freedom Budget,” developed by Bayard Rustin and economist Leon Keyserling in the mid 1960s, also included a guaranteed income as part of a package of proposals intended to eradicate poverty by 1975. In some versions, enacting a guaranteed income involved expanding and restructuring existing social welfare measures. In other iterations, it took the form of an annual sum that every citizen would receive unconditionally–comparable to the program in Alaska through which every resident receives a yearly, fixed share of the state’s oil revenues. The Poor People’s Campaign was conceived to create the political pressure required to enact the types of economic changes that Dr. King and his advisors believed were necessary. “It didn’t cost the nation one penny to integrate lunch counters,” King said during a February 1968 trip to Mississippi, “but now we are dealing with issues that cannot be solved without the nation spending billions of dollars and undergoing a radical redistribution of economic power.” The same month, he announced to reporters demands for a $30 billion annual investment in antipoverty measures, a government commitment to full employment, enactment of a guaranteed income, and construction of 500,000 affordable housing units per year. We will never know what the impact of the mobilization might have been if Dr. King had lived. On May 12, in the wake of rioting in more than 100 cities, Rev. Ralph Abernathy led a group of several thousand to Washington, D.C. and set up a shantytown called “Resurrection City” on the Mall. At the height of the Poor People’s Campaign, nearly 7,000 residents and supporters of the camp lobbied Congress and organized events to focus the nation’s attention on poverty. Nearly forty years later, on January 21, 2008, Democratic presidential candidates John Edwards, Hillary Clinton, and Barack Obama participated in a Martin Luther King, Jr. Day debate sponsored by CNN and the Congressional Black Caucus. Each candidate was asked whether Dr. King would endorse his or her campaign if he were alive. Without people taking action in the spirit of Martin Luther King’s vision, a few Americans may continue to gather inordinate wealth, but many others, thrust against their will into idleness, insecurity, or foreclosure by today’s crisis, will have little recourse but to wait for relief from a capricious and uncertain economy.